A VHF marine radio is important safety equipment on-board any watercraft. Commercial and recreational vessels alike use VHF marine radios for ship and shore communication. This radio equipment is crucial and can save lives in case of an emergency or extreme weather warning. For both offshore and on inland waterways, having the best VHF marine radio is not just for boat owners, but also jet skiers, kayakers and other outdoor adventurers on the water. We’ve reviewed the top rated VHF marine radios for 2018 and have put together a helpful guide to help you select the model that’s right for you. For more of my top gear recommendations, have a look through these popular Outside Pursuits guide links: Marine Battery, Marine Speakers, Handheld GPS. The Uniden MHS126 VHF marine radio is our editor’s choice for the best VHF marine radio. It’s a handheld submersible unit for less than $100. Uniden stands for high-quality radios and this highly affordable model comes with powerful features for your safety on the water. The Uniden MHS126 is extremely compact and lightweight with a weight of just 1.6 lbs. It features a floating design so it won’t sink should you ever drop it into the water. With an IPX8 and JIS8 rating, you can submerge it 5 feet for about 30 minutes. Thanks to the included belt clip and strap, you don’t have to test its ruggedness. The radio gives you access to all USA, international and Canadian marine channels. There is a quick access feature for channel 16 or channel 9. In addition, you also have all National Oceanic and Atmospheric Administration (NOAA) weather channels with weather alerts. If the radio detect a special weather warning signal, you can instantly be informed about extreme weather in the area. With a variable output, the Uniden MHS126 radio can improve its range: the transmitter works with a power of 1-2.5W or a boost of 6W for optimal responsiveness. Other features are the option to watch two or three channels at once, a memory scan mode, and a battery save mode. A built-in light can either be used as a flashlight or emergency SOS strobe. The included lithium-ion battery will last for up to 11 hours of operation. The Uniden MHS126 VHF marine radio includes a DC charger and AC adapter with a charging cradle and an accessory battery tray. If needed, you can connect an external microphone to the mic jack. The Uniden MHS126 VHF marine radio features and intuitive and easy-to-use interface with few buttons and a large LCD. With a high-quality built, a long-distance transmitting power, reliable battery life and compact dimensions as well as great price, it’s hands down our editor’s pick. The Standard Horizon GX1700W VHF marine radio is a high-end unit for fixed mount. It requires a separate antenna, which is not included. This compact model is rich in features with 12 channel GPS, DSC calling, navigation and noise cancellation. The radio is available in black and white for matching your other cockpit equipment. The compact design is intended for a flush mount with a depth of only 3.5”. The large 3” display is easy to read and has sufficient space for plenty of information. The radio is powered by your on-board DC source and can transmit at a power as low as 1W and as high as 25W. You can receive all marine channels and have full Digital Selective Calling (DSC) functionality. With a separate receiver, you will always receive information on channel 70 for reliable DSC transceiving. You can set custom names for channels for easy switching. The radio has a built-in 12 channel GPS receiver with a front-mounted antenna. A connection to an external GPS unit is possible. You can save up to 100 waypoints and navigate or use compass functions. Via DSC, you can poll the position of up to four ships. A dual channel watch is possible. For best transmission, the radio feature a noise-canceling microphone. You can connect a second microphone if needed. The GX17000W is JIS8 waterproof, which means it can be submerged in nearly 5 feet of water for up to 30 minutes. The die-cast chassis is rugged and durable, and the unit comes with a 3-year waterproof warranty. The Standard Horizon is the best fixed mount VHF radio for the money! The Icom IC-M93D VHF marine radio is a handheld device with a floating design. It features a higher price than our top pick but offers more functionality, including DSC, GPS and navigation. The IC-M93D has an ultra-slim body and a flat keypad. It fits comfortably in your palm or your pocket and is easy to use thanks to a large 2.3” high visibility LCD and an intuitive user interface with software key and straightforward functionality. The handheld marine radio works with all USA, international, Canadian and weather channels with alerts. With a dedicated DSC receiver, you will always be listening on channel 70. In addition, you have the option to use a dual or triple channel watch. Channels can be set as favorites. You can transmit with 1W or up to 5W power. Active noise-canceling technology removes background audio for clear communication. A rear button allows DSC distress calls. A float and flash function will activate if the radio falls into the water: the radio starts flashing, and pressing the DSC button will send a man overboard call. The integrated GPS provides your location, bearing and speed with accuracy and speed. You can set up to 50 waypoints with alphanumeric names for navigation from your position to a waypoint. With the included lithium-ion battery, the IC-M93D delivers 9 hours of operation while continuously watching channel 70. The radio is IPX7 waterproof and can be submerged in 3 feet of water for up to 30 minutes. The AquaQuake draining function clears water away from the speaker grill. If you’re looking for the best handheld VHF marine radio with DSC and GPS functions, the IC-M93D will be your best companion. The Lowrance Link-8 VHF marine radio gives you powerful and reliable performance with critical safety features, including Automatic Identification System (AIS). The VHF radio is meant for a bracket or flash mount installation and features great details such as both keypad and rotary dial controls and a fist microphone with full rubber grip and duplicated buttons. The large display has a resolution of 128 x 256 pixels and is easy to read thanks to an amber background. You connect your 12V DC power to the radio. Transmissions are possible at 2W to 23W. The radio is ITU-R M493-13 Class D VHF compliant for constant listening on channel 70. In the USA, you get 53 channels, plus 55 international and 61 Canadian channels as well as 10 weather channels with alerts. You have dual and triple scanning modes. DSC functionality includes distress calls and a button for man overboard. You can connect a GPS receiver for automatic positioning. With dual channel AIS, you can receive identification information for other vessels, including name, call sign, MMSI number and position as well as destination. The Track Your Buddy function allows you to follow a friendly vessel at all times. There are also 20 programmable alphanumeric names for MMSI numbers. You can connect an external speaker and use a PA or hailer horn output with a listen back feature. A dedicated weather key gives you critical updates quickly. The Lowrance Link-8 VHF marine radio is JIS7 and IPX7 waterproof and can be submerged in 3 feet for up to 3 minutes. It requires an external antenna and includes a sun cover and a microphone clip. This VHF marine radio is a good choice if you require AIS functionality for your mounted unit. The Cobra MRHH350FLT is a budget handheld VHF marine radio with a floating design and sufficient features for most casual and recreational boaters. The unit is compact and durable with an ergonomic design and good grip. It will float when you drop it into the water. With JUS7 and IPX7 waterproofing, it can be submerged in 3 feet for 30 minutes. The BURP function will simply vibrate any water out of the speaker grill for continued use. The VHF marine radio covers all USA, Canadian and international channels and also ten NOAA weather channels with alerts for instant access to weather information. A button will instantly put you onto channel 16 for emergency situations. Transmission power is variable with 1W, 3W and 6W power for optimal responsiveness and maximum range. Tri-watch lets you monitor 3 channels at once, while the signal strength meter always informs you about the receiving and transmitting signal. You can program unlimited memory channels for easy retrieval during scanning. The included lithium-ion battery can be charged in the unit and will last for up to 8 hours at 6W or up to 16 hours at 1W power. You can connect an external microphone or speaker. Charger, AC adapter, DC plug, belt clip and even a replacement antenna are all included. The only drawback of this model is the comparatively low-capacity battery, but that can easily be fixed with a backup battery or on-board charging. The Standard Horizon HX870 is a floating handheld VHF marine radio with powerful features and probably the best handheld VHF radio. This higher-priced model has a transceiving power of 6W, a high-performance GPS and DSC functionality for all boaters. This handheld marine radio is compact and lightweight, yet features a large 2.3″ full dot matrix LC with high contrast for best readability. The icon and menu system makes it simple and straightforward to operate the radio. The intuitive interface is suitable for all users and give you quick access to all major functions with just a few button presses. The HX870 is designed as a durable workhorse with a rugged die-cast chassis and IPX8 and JIS8 waterproof rating. It floats on the water and can be submerged for up to 30 minutes in 4.92 feet of water. Contact with water will activate an emergency strobe light, which you can also program to flash, Morse SOS, or shine like a flashlight. The 1,800mAh lithium-ion battery provides long standby power and the HX870 goes up to 6W of transmitting power for extended reach. You have access to all USA, Canadian and international VHF marine radio channels, as well as 10 NOAA weather channels with alerts. The radio features a separate receiver for constant monitoring of channel 70. Programmable memory, priority scan and dual or triple watch round out the scan functions. Video: Overview of the Standard Horizon HX870. The radio comes with an integrated 66 channel WAAS GPS receiver for full DSC distress call with your vessel position. In addition, you have waypoint and route navigation with up to 200 individual waypoints and 20 routes. The compass page can also show up to 9 vessels in your vicinity with the Group Monitoring function. Via the USB data port, you can copy GPS position logs to a computer or load waypoints onto the device. The HX870 also features a noise-canceling microphone for clear audio. A 3-hour quick charger and an extra battery tray are included. The radio comes with a 3-year waterproof warranty and is a great fit for any demanding boater looking for a reliable handheld model with lots of functions. The Uniden UM380 VHF marine radio is a compact and budget fixed mount model. You can choose between black and white and get a rugged radio with good functionality. The radio works of your boat’s 12V DC power and can transceive with 1W or 25W. You have the full range of all US, international and Canadian marine channels with NOAA weather channels and alerts and a separate receiver just for channel 70. You can connect the radio to an external GPS for full DSC distress calls. The radio handles intuitively and the large LCD is easily readable. You can watch up to three channels, program channels, set individual names and do a memory scan. The microphone features noise-reduction technology and has a good rubber grip. The UM380 is JIS7 and IPX7 rated for waterproofing and can be submerged in 3 feet for up to 30 minutes. The UM380 is the best handheld vhf radio under $100. What Type of Radio is Right for You? Our review includes both handheld and mounted devices. You can choose between mobile, battery-powered units and larger radios for fixed installation in the cockpit of your boat. The further out you’ll venture, the more important the range or transmitting power becomes. Some units have a broader channel selection and features such as the ability to listen on several channels at once. Also consider how important display aspects are for you and if you’ll require extras such as noise reduction technology or a built-in GPS. Our review features both handheld as well as mounted units for permanent installation. Both have their strong points. 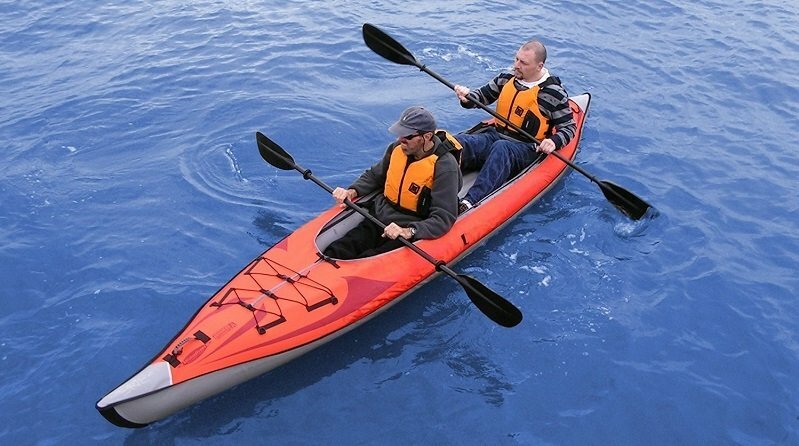 These are versatile in terms of portability and are well-suited for smaller boats. They’re ideal if you’re boating one day and kayaking the next, that way you’ll always rely on the same radio. All models already include an antenna and everything else you need. The power is typically 5W or 6W maximum. Handheld devices also make for great backup models. These units are commonly installed in the cockpit of your boat. They require a power source and normally work with 12V DC. They also need an external antenna, which you’d typically mount onto the roof of your boat for best results. The legal transceiving limit for VHF marine radios is 25W. Fixed installation models can feature a hailer function or Automatic Identification System. Due to the higher power, a permanently installed radio can cover distances of up to 20 miles. These radios are recommended if you regularly travel greater distances at sea. The transmitting power related directly to the receiving and sending range of your VHF marine radio. Handheld models top out at 6W, while the highest value for fixed mount units is 25W, which is roughly equal to 20 miles, depending on the antenna you use. Handheld units but also fixed models feature power-saving modes, which effectively limits the power to preserve energy. The watch function of VHF marine radios allows you to monitor other channels as well, apart from the one the radio is currently tuned to. Dual watch means you’re monitoring two channels at once, and triple watch means you’re monitoring three channels at the same time. In case of activity, the radio will alert you. This allows you to follow channel 16 and channel 9, for example, as well as a weather channel. Receiving a weather alert early can literally save your life, especially when you’re out at sea in a small vessel. The alert function notifies you of emergency broadcasts. Weather channels are divided into the National Oceanic and Atmospheric Administration (NOAA), which are national, and regional alerts, Specific Area Message Encoding (SAME). Digital Selective Calling or DSC for short allows you to use certain functions are automatic distress calls. If your radio is fully set up, you can alert the coast guard and other boats in the vicinity with the push of a button, sending out your position as well if GPS is available. You will also need a MMSI number, a Maritime Mobile Service Identity, to identify your vessel. Fixed mount VHF marine radios are required to have DSC functionality. Depending on the model, you can also poll position data from nearby ships. A GPS receiver can be very useful, especially on handheld devices, because it eliminates the need for a separate device. A radio coupled with GPS information can send automatic distress calls via DSC. In addition, VHF marine radios offer navigational features with routing, waypoints and position watching. There are many applications, such as fishing, plotting your course or finding your destination. Short for Automatic Identification System, AIS allows you to locate and identify other vessels. A variety of values can be transmitted, from name and number to position, destination, cargo and size. VHF marine radios commonly only feature a receiver which is not able to send information about your ship or watercraft. When you’re on the water, things inevitably get splashed or submerged in water. A water resistant or better yet, waterproof radio is important, especially for handheld devices. These commonly feature a buoyant or floating design which prevents the radio from sinking. Manufacturers use the JIS (Japan Industrial Standard) or IPX (International Protection Code) for their ratings. JIS0 or IPX0 is the lowest and means zero protection. Important are JIS7 and JIS8 or their equivalents, IPX7 and IPX8. This means the unit can be submerged for up to 30 minutes, either in up to 3 feet or up to 5 feet of water. A large and readable display on a VHF marine radio ensures reliable operation, regardless of direct sunlight or darkness. Noise-canceling technology is very useful to have in order to suppress engine noise, wind and waves. Active canceling improves the signal both ways, for sending and receiving. Dual station functionality on a fixed model means you can install a separate microphone and operate the system as an intercom. The hailer function is only common in high-end models and connects an external speaker for broadcasts, either on deck or to other vessels. The listen-back feature is for converting that speaker into a microphone to await a response or to amplify audio from the foredeck or from a distance. The market for VHF marine radios is dominated by four manufacturers: ICOM, Standard Horizon (Yaesu), Uniden, and Cobra Electronics. All of them offer a variety of radios for handheld and fixed mounted use. Q: What is VHF marine radio? A: VHF stands for “very high frequency” and refers to the range between 156 and 174 MHz, called the VHF maritime mobile band. Large ships and nearly all seagoing small vessels use VHF marine radio; slightly different regulations apply on rivers and lakes. Use cases include sending distress calls and communicating with other craft, harbors, locks, and marinas. Q: Do I need a VHF marine radio, and do I need a license? A: Recreational vessels less than 65.6 feet in length are not required to have a VHF marine radio, but having on on board ensures your ability to communicate with other vessels and be hailed by others in distress. It also gives you the capability to receive important information such as weather warnings. Under the Telecommunications Act of 1996, recreational boaters can own and use a VHF marine radio without an FCC ship station license. The situation is different for commercial vessels, traveling in international waters, HF radios, and boaters under special regulations. Contact the FCC if you’re not sure what applies to you. A ship station license application is made on FCC form 605. Q: What are DSC and MMSI? A: Digital Selective Calling (DSC) is a standard for sending predefined digital messages on marine radio as part of the Global Maritime Distress Safety System (GMDSS). A DSC distress signal can replace a voice call procedure to hail other vessels. A DSC sender is programmed with the Maritime Mobile Service Identity (MMSI) of the unit and can use a GPS signal for a very quick distress signal. Q: What are all these channels? A: VHF marine radio operates on standard frequencies known as channels. Channel 16 (156.8 MHz) is the international calling, safety and distress channel. Recreational boaters should also be familiar with channel 9, a supplementary channel for non-commercial vessels to relieve congestion on VHF channel 16. These channels are used for calling only – once contact has been established, your conversation has to take place on a working channel, commercial or non-commercial, depending on the type of your craft. The US Coast Guard relays marine information broadcasts on channel 22A. Q: If I have a VHF marine radio, do I need to listen to it? A: Even if you’re not required to carry a VHF radio on your boat, if you have a radio, you must maintain watch on channel 16 whenever the radio is operational and not being used to communicate. Not only will you be able to catch urgent marine information broadcasts, you can also be contacted by other vessels. Q: Will other electronics interfere with my VHF marine radio? A: Yes, on-board electronics can interfere with radio reception and generate noise on some or all channels. For mounted radios, route the cabling away from other equipment and always keep leads as short as possible. Use handheld devices away from other electronics. Q: How do I eliminate noise from my VHF marine radio? A: First, disconnect the antenna to see if the noise is caused by the DC power line, which you can eliminate with a DC noise filter. If the noise enters through the antenna, power off all other devices, then power them back on one by one to see what is causing interference. If you’ve found the source, try to isolate it, shield it or ground it, or relocate the radio if necessary. Q: How long can a buoyant handheld model float in the water? A: Even buoyant models are not fully waterproof and you should retrieve a floating VHF marine radio immediately. Q: Why use a VHF marine radio and not just a cell phone? A: Even when you’re not obligated to use a VHF marine radio, a cell phone is less than optimal. Mobile phones rely on cell towers, which are on land. Even if you have coverage at sea, the emergency services you are able to reach might not be the right one for your emergency. A VHF marine radio can directly put you in touch with the coast guard or nearby vessels. VHF marine radios are also much better equipped to withstand conditions at sea. Whether you’re out sea kayaking, fishing, or just going on a leisure cruise in your recreational boat, don’t leave shore without a VHF marine radio. It is your means of communication in an emergency and reliable way of reaching for and receiving assistance. Use our guide to select a model that works for your needs and choose from our reviewed best VHF marine radios. From rivers and lakes to outdoor adventures at sea, be smart and safe by bringing a marine radio with you! I hope this guide was helpful for finding the best VHF marine radio to fit your needs. If you want to comment or recommend a kayak I didn’t include, please use my contact form to get in touch. Thanks for the article, the information was useful to a returning boater out of Dry Dock !!! !